The name of the clan refers to the remnants of an old airstrip located in their territory. Clan members leave the Crater to hunt in areas outside the Crater when prey abundance in their territory is low. During these commuting trips, they may travel distances greater than a marathon per day. A large clan that attracts not only males from the other clans resident on the Crater floor but also males from Crater rim clans and clans from outside the Crater. Mwindaji was a very special hyena male in many ways. He was the first male that immigrated from outside the Crater. Analyses of his mitochondrial DNA confirmed that he was born in the central Serengeti, an area 120 km distant from the Ngorongoro Crater. He joined the Airstrip clan in December 1999. In June 2005, Mwindaji formed a coalition with Pindi, an immigrant male born in the Lemala clan. Together, they repeatedly challenged Adonis, the beta male of the Airstrip clan, in an attempt to overtake him in the male hierarchy. But Adonis had good relationships with several Airstrip females. He could count on their support whenever he was attacked and thereby managed to maintain his high position. The following year, Adonis however left the Airstrip clan and joined the Lemala clan. Thus, with some delay, Mwindaji achieved his goal and rose to a higher position in the hierarchy. Mwindaji was also one of the best hunters in the Crater and adored by the females. During the 11 years in the Airstrip clan he sired 19 cubs, of which 17 survived to adulthood at two years. 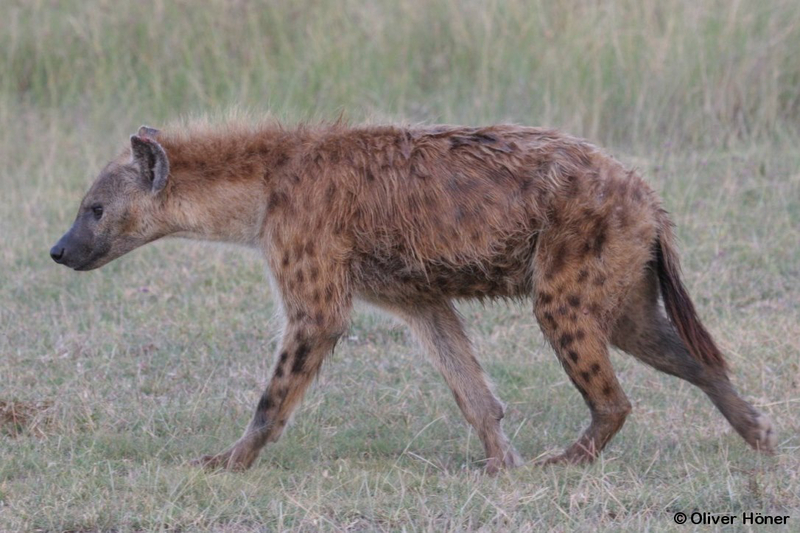 This made Mwindaji one of the world’s most successful spotted hyena males. He sired this exceptionally high number of cubs despite the fact that he was the highest ranking male of the Airstrip clan for a mere eleven months. He died at the age of 14.5 years which corresponds to approximately 80 years in humans.